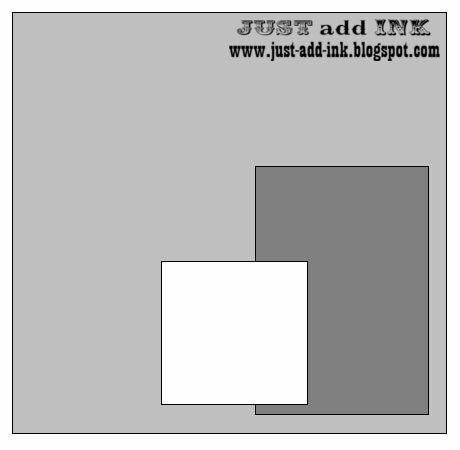 Just Add Ink #19 - A Colour Challenge! 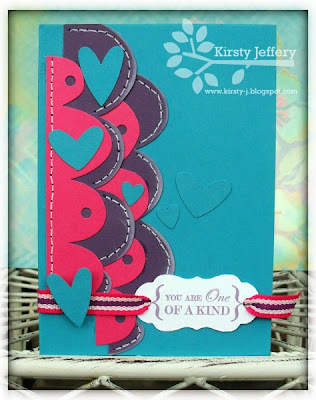 We hope you love this weeks colour combo as much as the Just Add Ink team did - it's a beauty! Beautiful colours, unique combination and indeed a good challenge. We can't wait to see what you come up with! If you don't have the exact colours please use a close alternative. You can add neutrals (Kraft, Black or White) to your project/s if you wish. Please use the keyword JAI19 when uploading to public galleries. Your creation must be exclusive to our colour combo challenge. Entries with 3 or more alternative challenges listed (ours included) in the post will be deleted at the discretion of the JAI hosts. Mr. Linky will close Wednesday June 2 at 23:59WST. Be here on Thursday June 3 to see our Top Picks. Thanks for all your fabulous entries this week for our sketch challege! We loved 'em so much - it was a very tough week for judging. Who am I kidding? It's always a tough week for judging! Here's this weeks Top 6 picks... be sure to click on their name/pic to share some comment love. Thanks again to everyone that played along this week! Tomorrow we have a new colour combination for you to play along with. I work as a grade 5/6 teacher at a local Christian School and oversee the Junior Campus in an Assistant Principal’s role. I love a variety of crafts. My first love was knitting and I first knitted a jumper for myself when I was in grade 7. I studied Art in Year 12 and loved painting and screenprinting. My dad used to have his own screenprinting business and a love of photo silk screen grew from that. Not many people could boast access to their own darkroom to develop photos! Sadly, I let that hobby slip and I’m so behind with the technology now to ever catch up. In 2001 I did an Adult Ed. Course on Teddy Bear making and have made over 100 of the furry creatures. I designed one pattern and maybe I’ll market that one day. Then I developed a love of beading and jewellery making, followed by stamping and papercraft. I’ve always loved to ‘make’ things and still dabble in all the areas that I’ve outlined. 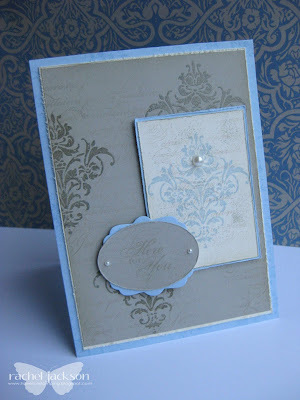 Of course stamping and papercraft is the main ‘love’ at the moment. A friend is teaching me to crochet at the moment and you’ll see some of my attempts, probably attached to cards at a later date! Stay tuned. I’ve always ‘crafted’ for as long as I can remember. My paternal grandmother taught me how to knit at the age of 4. I could never just watch a movie when I was of High School age, as I had to knit, or whatever, while I was sitting down watching TV. I LOVED doing school projects. Making them look pretty was more important than the information that was in them! This is probably where my deep down love for papercraft has stemmed from. 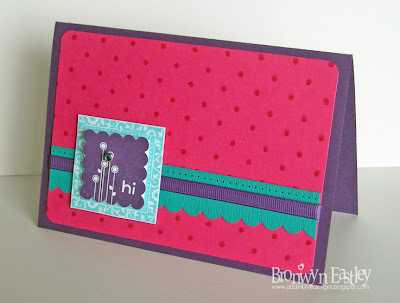 I was asked to a Stampin’ Up! Workshop in May 2008. I thought it would be great to purchase a teddy bear stamp to make my swing tags for my bears. Well, I haven’t finished any bears since and the world of stamping has taken over. I just love it! 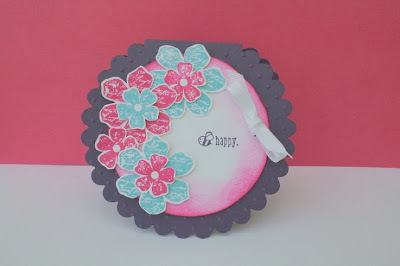 I have Mondays off so that’s usually my stamping day and I fit the odd hour or two in over the weekend. I don’t get much time during the week but if my husband is on night shift, I’ll head off into the rumpus room to craft. 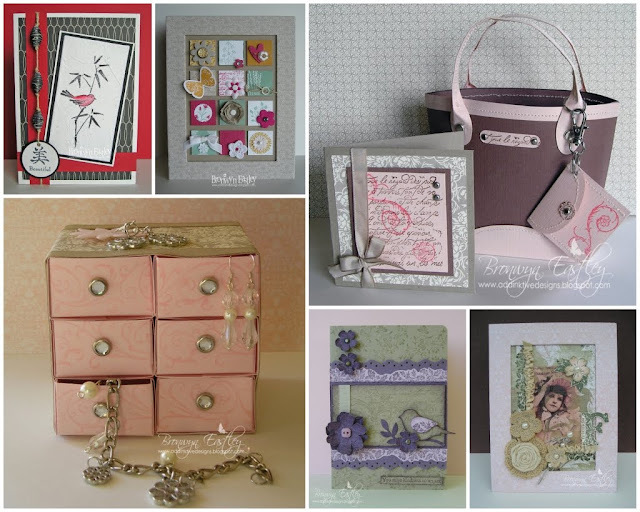 Inspiration comes from the JAI girls and many talented crafters whose blogs I follow or subscribe to. My upline (now retired), Amanda Aitken, is a wonderful source of inspiration and we still craft together when we can. I’m so glad she’s back into blogging so I can be inspired by her awesome work when we don’t get time to ‘catch’ up. 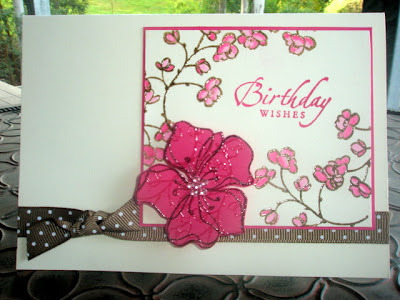 Inspiration also comes from magazines, Splitcoast Stampers etc. 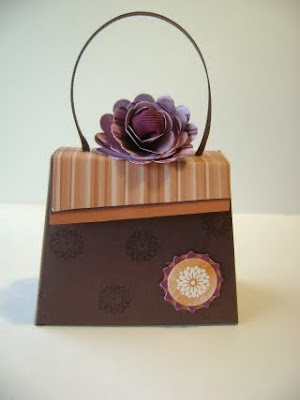 I really enjoy the emerging colour and collage techniques and I love 3D stuff, particularly bags! I would love to design some of my own templates one day! I’d love to know how to use the brayer a little more subtly. I’m a bit heavy handed with it and would love to get the effect that Michelle Zindorf and Delys Cram seem to achieve so effortlessly! 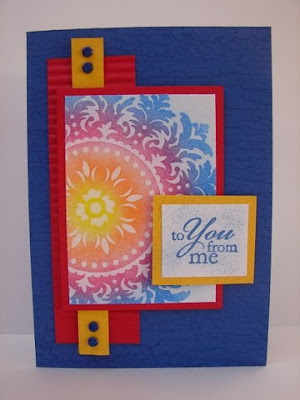 I really enjoy this style for silhouette stamps and there usually has to be a moon in there somewhere! I keep a journal that I write in colour combos, techniques etc. and have several folders on the computer with saved photos for reference. I refer to my journal when I’m looking for a colour combination to do. I save files of sketches so I have an idea on hand when I’m stuck. If you haven't already entered, the cut-off time is Wednesday May 26 at midnight WST and you can submit your entries HERE. We've got a really awesome sketch for you this week. Remember, it does not need to be taken literally. You can flip it, rotate, stretch or shrink, add a few things here and there, as long as you use the sketch as a guide, you should be right. The reason these have such a minimal design is so you can play with it a bit - whether you're a cardmaker or a scrapbooking person. 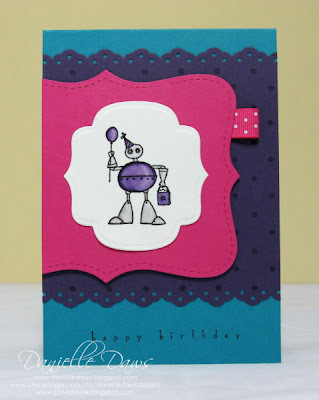 Make a papercraft project - a card, scrapbook layout, 3d object, etc using our sketch. Please use the keyword JAI18 when uploading to public galleries. Mr. Linky will close Wednesday 26th May 2010 at 23:59WST. Be here on Thursday to see our Top Picks. Today we're giving a tour of one of our regular 'players', Gardenia Pepworth's craft space. Last Christmas Gardenia moved to a remote part of Western Australia on a mining lease where her hubby works. She describes herself as a chef, a cleaner, a chauffer, a mediator, a rule maker, a go-to gal - basically a CEO of a major company – her family. When she returns to the real world she will be working in Children’s services. She loves everything paper, mostly cards but she loves to scrapbook when there's time.She also loves to sew, knit, crochet and have a go at anything crafty. She refers to her craft space as her "Obsession Area". What's one of your fave crafting toys? 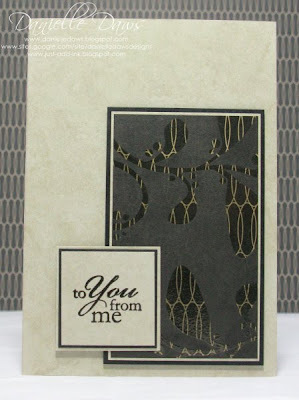 I bought my Stampin’ Up! Colour Caddy a little while ago, and just love it to bits. My Big Shot is also my new best friend too, it sits right next to me that way I can use it all the time and its not so far to lift, they are heavy! How to you store your stamps and punches? I have a set of four draws that I “borrowed” from my girls when we moved as they both got their own robes. The top three are for stamps and the bottom is for punches, paper cutter and circle scissor. Every time I place an order I have to rearrange it all so that it will fit. Tell us about your awesome storage tip for daubers and sponges! My sponges and daubers are kept in containers (see below) that I found at a hardware store. Each one has their own spot and most of the daubers are labeled too, for those times when they are everywhere. What was your last major "investment" for your craft area? A set of craft drawers that a friend picked up for me last time she was in Perth. There are 6 draws so I have divided them into DSP, Neutrals and In-colours, Bold Brights, Earth Elements, Rich Regals and Soft Subtles. I only wish she got me TWO! I was shocking with my scraps before. I had two scrap boxes of card and DSP They were overflowing and I never pulled them out. It was just easier to start a new piece. So when I got these new drawers for my paper and card I sorted them all out and back into the draws, this way I am managing to use them up slowly! I have way too many scraps! 3. Have a place for everything, once things start having to live on your workspace you are in trouble! The cards that I have made are packaged and labeled and I keep them in plastic containers (below). What item has a permanent home on your desk? 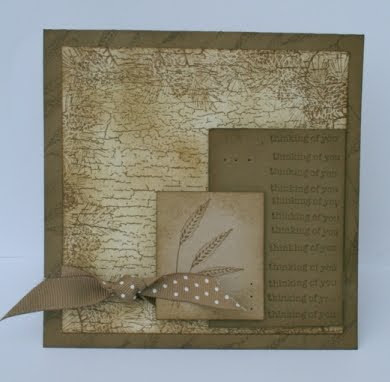 I am in love with my Stampin’ Stack and Store. I keep any empty containers and fill them with extra punched out pieces of cards, magnets anything that will fit! And when you're working on projects, what always ends up on your desk? Stamp pads, Sponge daubers, paper trimmer, scissors, sticky strip and my Stampin’ Scrub are always on my desk once I finish creating! I use them with nearly every creation I make. I made a ribbon holder a few weeks back when I got sick of all my ribbons getting tangled together. I pulled out a strong cardboard box that I bought at Spotlight a while back. I found a piece of thin dowel in the shed and cut it in three. I put holes in the sides of the box and put the dowel through. It has heaps of room and if I only put on the smaller rolls I can even put the lid on! Say you did need a little inspiration - where would you find it? 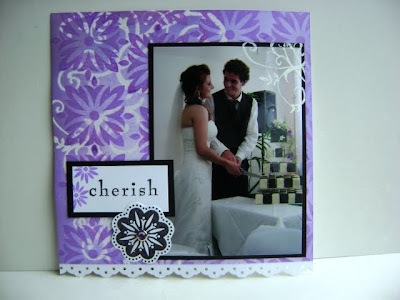 I hit the internet when I need inspiration, places like SplitcoastStampers.com is always good. Or I blog hop. I start at mine and click on one of my links to a blog I look at all the time, and just keep going! Five [crafty] things you can't live without? Paper trimmer, sticky strip, bone folder, sponge daubers and punches. Any other fabulous storage ideas you'd like to share? Storing tutorials and templates. When I print them I select to print multiple pages per sheet. I pick four. I cut them up and put them in order and then punch two holes through them with my Crop-o-dile. I put them together with craft rings that you buy for chipboard books. 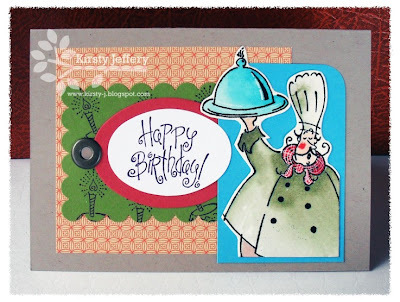 In between each tutorial I add a strip of card, so that I know where one ends and the next begins! How do you hope your craft room evolves from here? I would love to have my own stamp “room” however I don’t think I would use it as well if I had to hide away from day to day life. I would LOVE though to have floor to ceiling shelves that I could store everything on and a door or something over them to hide my mess! Well, I don't know about you, but I'm completely inspired by Gardenia's space! I hope you have found a lot of her ideas brilliant and a big thank you to Gardenia for giving us a tour! We love your space! 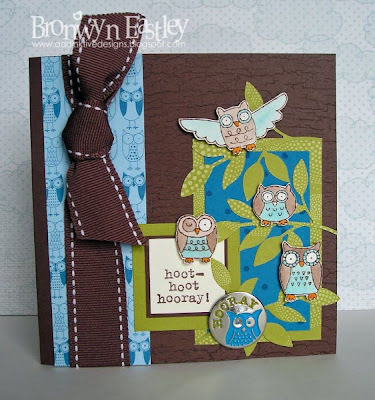 We hope you enjoyed the Blog Hop this week, if you would like to see the blog hop and tutorials in a flash they will be permanently available when you click on the "Blog Hop" button in our sidebar. Thanks to everyone that left comments on the JAI blog and on our individual blogs! The DT was buzzing this week (more than usual! ), and we are all so thrilled that you enjoyed our tutorials. As always, you can click on the Top 5's names or creations to go directly to their blogs/details. Thanks again to everyone that played along this week! Tomorrow we have a new sketch challenge for you to play along with. 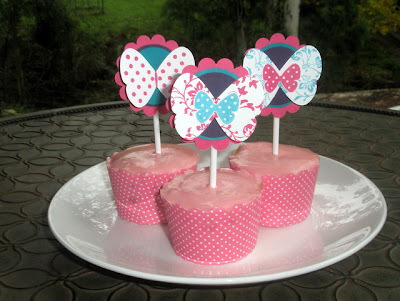 Have you done the Blog Hop yet? It's a fabulous way to get inspired, with loads of inspiration, techniques and tutorials! And the challenge this week fits right it - just choose a technique to do! If you haven't already entered, the cut-off time is Wednesday May 19th at midnight WST and you can submit your entries HERE. 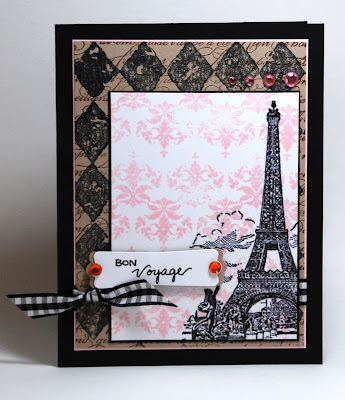 Just Add Ink #17 - A Blog Hop! 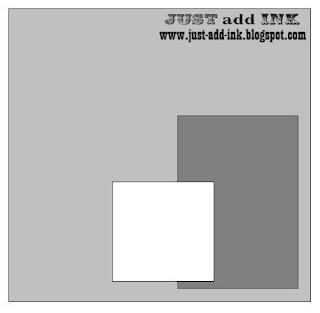 Just Add Ink #16 - A Colour Challenge!